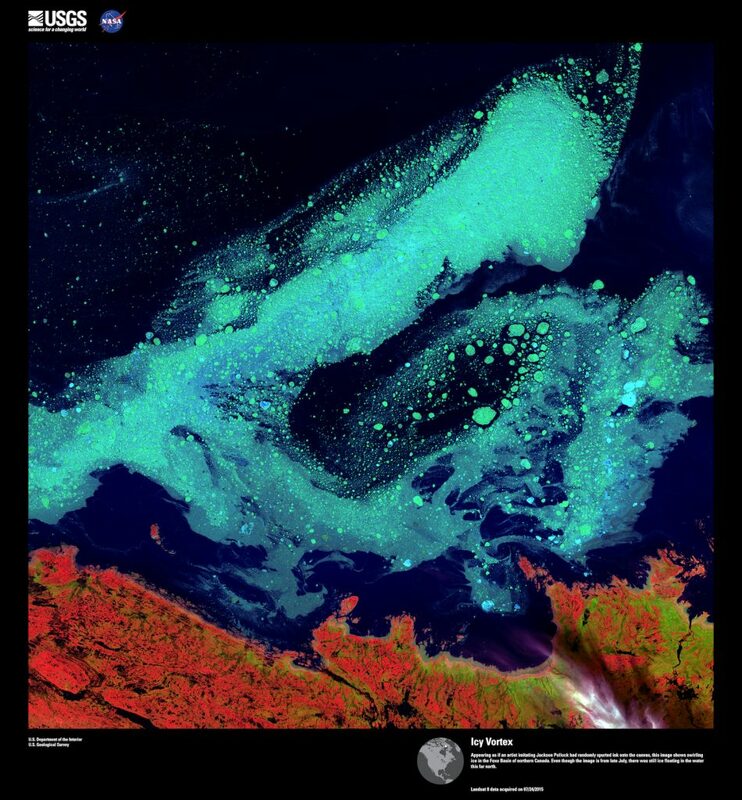 Scientists with the U.S. Geological Survey have created an “Earth-as-Art” collection of brilliant images from space, as seen from Landsat satellites. Some pictures of Earth formations are reminiscent of actual paintings; some include familiar objects; and some are like abstract creations. Some show the actual colors of earth, sea and sky, while some of the colors are created with filters to highlight natural colors or even to capture light beyond the visible spectrum. These images remind me of the LIDAR images created by the Washington Department of Natural Resources, which I called works of art in a blog post nearly a year ago. See Water Ways, Dec. 11, 2017. 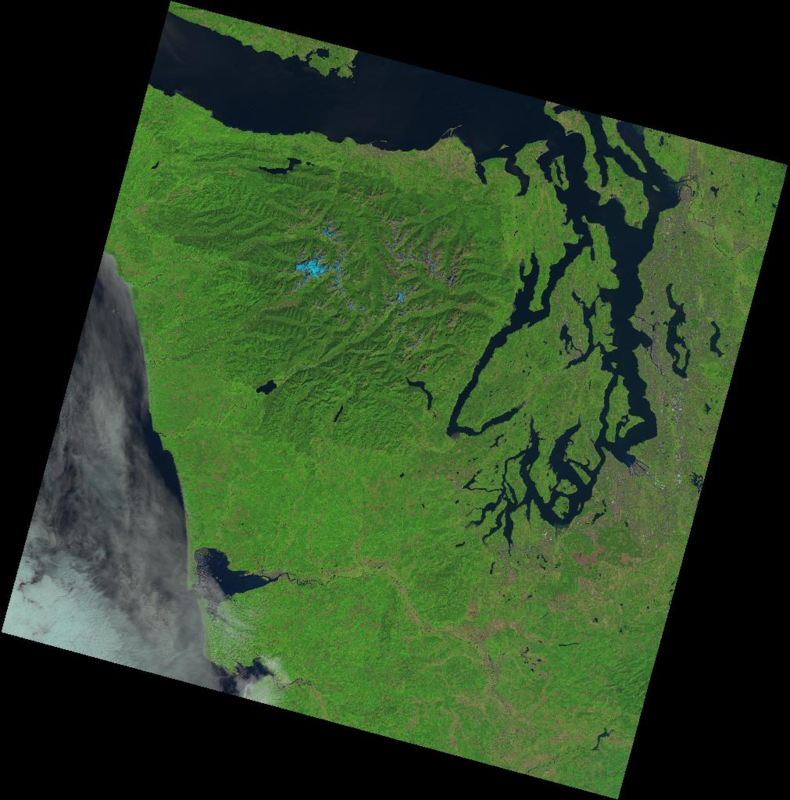 I included images of Puget Sound among some satellite photos posted previously. See Water Ways, Sept.11, 2017. Landsat 8, an American observation satellite, was launched four years ago. Since May of this year, the satellite has recorded more than a million images. As one might expect, satellite images of the same place vary over time, considering that clouds, smoke, vegetation and geological phenomena alter the appearance of the Earth’s surface. You can see some differences in the pictures of Puget Sound on this page. The first was taken on Aug. 27 and the second on Sept. 7. The third picture, taken on Dec. 18, 2016, shows Mount Rainier in the lower portion of the photo with Puget Sound in the upper part. 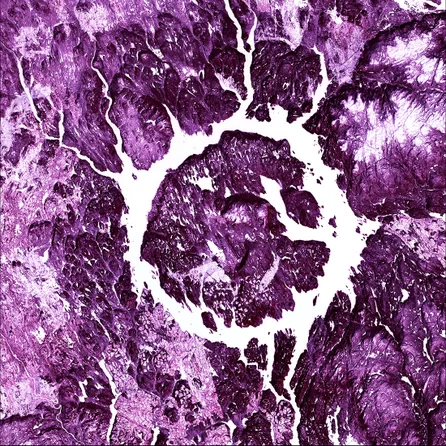 In some areas, the Landsat photos are so intriguing that they have been compared to works of art. Staffers at Live Science, an online magazine, chose 73 images to share with their readers. 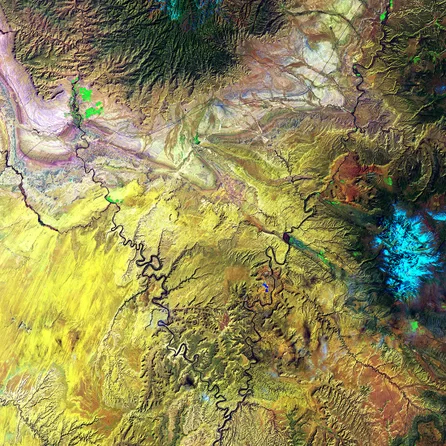 See their full collection of “Artistic Views of Earth from Above” at Live Science. I’ve picked some of my favorites and shown them below. 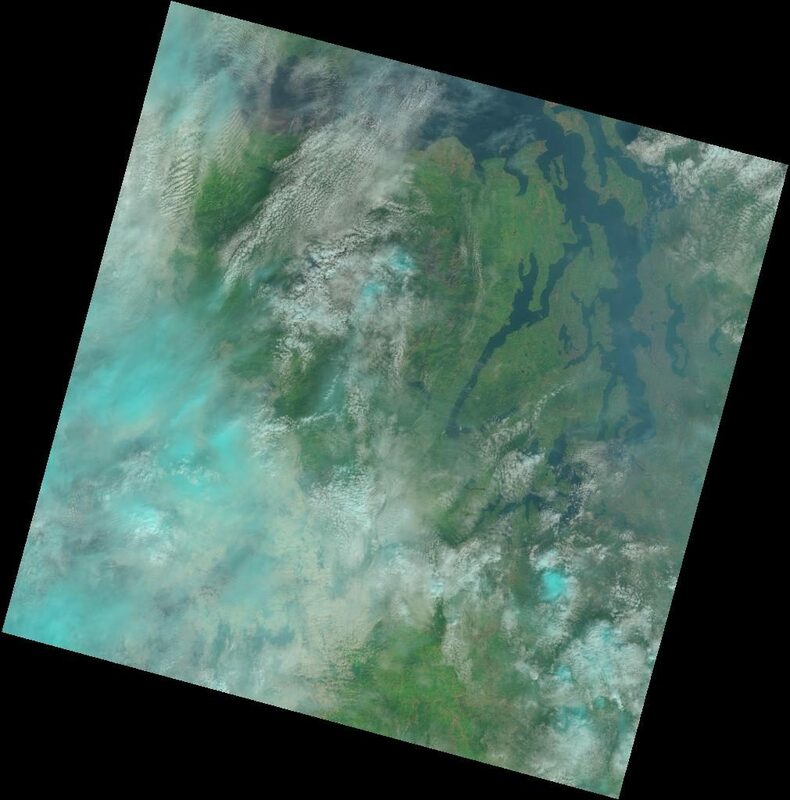 If you are interested, you can go to the source of the Landsat images, managed by the U.S. Geological Survey. I used a program called EarthExplorer to find the images of Puget Sound and Mount Rainier. Another search engine, LandsatLook Viewer, lets you zoom in on an area of North America or other continents to obtain satellite images. A third approach is GloVis, with its multiple filters to narrow your search. 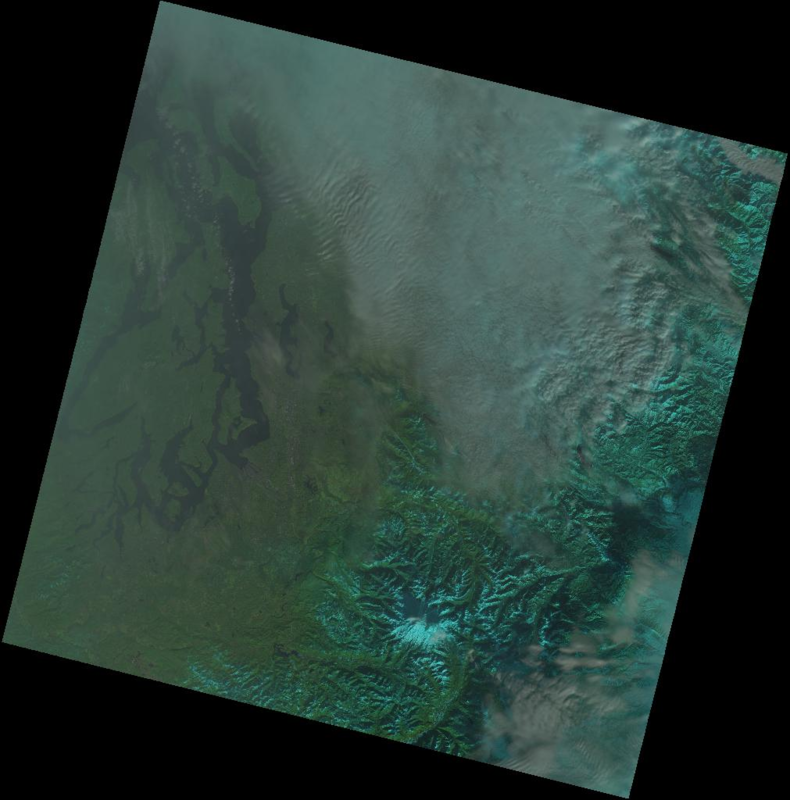 The datasets are a collaboration between NASA, which developed and launched the satellite, and the USGS, which developed the ground systems for processing and sharing the data. Following are four of the “artistic views” researched and provided by Live Science, which today is offering 73 fascinating photos of Hurricane Irma. 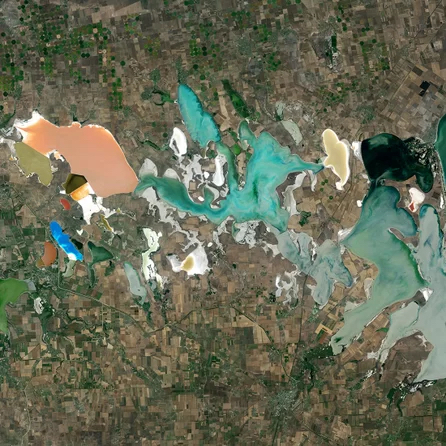 Putrid Sea: The various colors formed in a cluster of lagoons on the Crimean Peninsula provides an interesting painting, but the area has a reputation for foul odors caused by the algae that gives the water its color. The proper name of the area is Syvash, but some call it the Putrid Sea. The Syvash is part of the disputed area controlled by Ukraine until Russia sent in troops to annex the area in 2014. Eye of Quebec: One of the Earth’s largest and oldest known craters was formed by the impact of a three-mile-wide meteor some 214 million years ago, experts say. The resulting Canadian lake, Lake Manicouagan, has been called the Eye of Quebec. The original crater was about 62 miles across, but erosion and deposition of sediments has reduced that to about 45 miles today. The island in the center of the lake is known as René-Levasseur Island. I suspect the purple image is produced by selecting one region of the light spectrum. 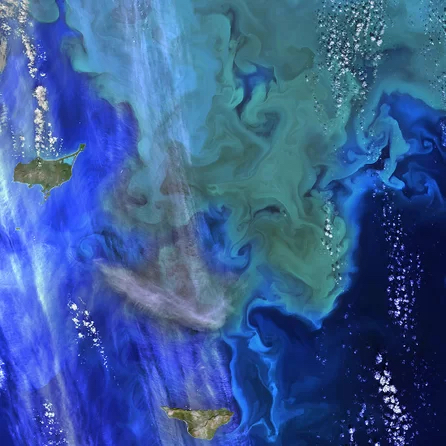 Green on blue: The swirls of green and blue in the picture are largely phytoplankton floating in the Bering Sea, the body of water that separates Alaska from Russia. The plankton typically grow when there is an abundance of sun and nutrients, often reaching their peak at the end of summer. This photo, taken on Sept. 22, 2014, shows a few scattered white clouds dotting the sky.